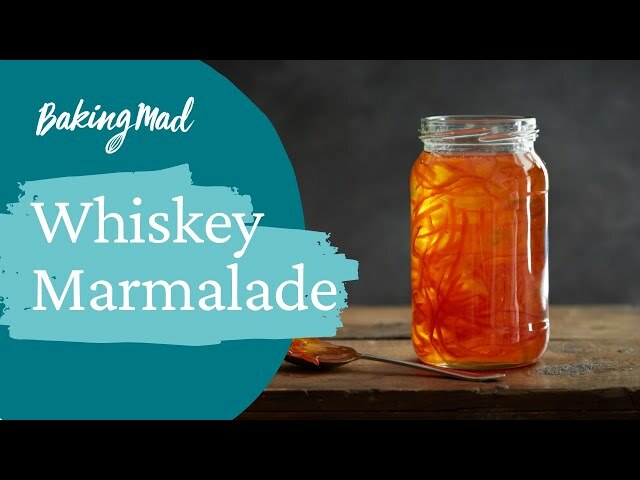 This delicious marmalade is made with Seville oranges with a dash of Scotch whisky, a great gift for Father's day or a homemade Christmas present. Wash the oranges and place in a large pan with 3 litres of cold water, weighing them down with a heat proof plate so they are submerged. Bring to the boil, cover and simmer for 2 hours or until the oranges are very soft and easily pierced with a fork. Remove the oranges to a tray and cool them enough to handle. Reserve the cooking liquid. Cut the oranges in half and scrape out the pips, fibrous membrane and pith and add this back into the cooking liquid and simmer uncovered for 15 minutes. Meanwhile cut the peel into 3cm x 2mm strips. Place a sieve over a preserving pan and strain the cooking liquid into it. Use the back of a ladle to squeeze out as much pectin as possible from all the pith ensuring the marmalade will have a good set. There should be about 1.5 litres of liquid remaining, add water to top up if not. Add the sliced orange peel and the lemon juice with the warmed sugars and stir to dissolve the sugars over a medium heat. Place some small saucers in the freezer. Bring to the boil and boil rapidly for about 8 - 15 minutes for the perfect set. To test for the correct set, turn the heat off and spoon a little of the marmalade onto one of the saucers from the freezer. Leave it for a moment, then push it a little with a finger and if the marmalade wrinkles it is ready and if not boil for a few more minutes and test again until it wrinkles. Stir in the whisky and skim to remove any scum. Add a knob of butter and stir through to dissolve any remaining scum and cool for 20 minutes. Stir to distribute the peel just before pouring into warm sterilised jars (sterilise lids and jars by putting them through the dishwasher and leaving them to dry or washing them in soapy water and placing them upside down in a preheated oven 140C, fan 120C, gas 1 for at least 25 minutes). Screw on the lids (may have to use wax discs if the lids don’t have plastic insides) and label. I think I just stumbled upon the recipe I was searching for. Going to try this with my current batch of oranges and Fireball for the whiskey. Stay tuned! Billington's unrefined natural sugar has been very carefully produced to lock in, rather than refine out, the natural molasses of the sugar cane. It is this difference which gives Billington's sugar its unique richness, depth of flavour and natural colour. It replaced white sugar naturally.